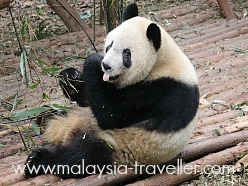 Why should a website about Malaysia be writing about Top Singapore Attractions? Of course Singapore is a separate, independent nation but it shares a common heritage and similar culture(s) to its much larger neighbour Malaysia. 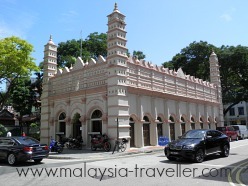 Being located on a bustling island just a stone's throw away from the southern tip of the Malay Peninsula, it makes sense for visitors from afar to combine both countries in their travel itineraries. 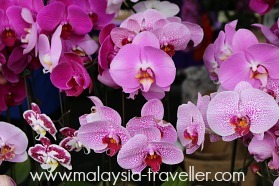 Singapore is a beautiful city crammed full of interesting places to visit and things to do. Here are some of my favourite top Singapore attractions. I have grouped my selection under 3 headings: Nature, Fun and Culture. This world-leading zoo combines three Singapore tourist attractions in one: Singapore Zoo, Night Safari and River Safari. Singapore Zoo is recognized as one of Singapore's best loved family venues and the Zoo has done a great job in keeping their animals comfortable by emulating natural habitats ranging from frozen tundra to tropical rain forest. The best zoos in the world have moved away from old-style, viewing wild animals in captivity. Singapore Zoo is now all about experiential learning with emphasis on conservation of wildlife and their threatened habitats. Its free ranging Orang-Utan habitat is one of the zoo's highlights. Warning: A day at the zoo is not cheap, particularly for large families. Admission to Singapore Zoo is a hefty S$28 for adults and S$18 for kids and that's before you pay for meals, ice creams, souvenirs, transport or parking. Still, the money is being put to a good cause - giving the best possible care to the animals. Opening hours are 8.30am to 6pm. Night Safari focuses on those species which are more active after dark and visitors can see 130 nocturnal species and night hunters from a 35 minute tram ride with commentary or by taking a walking trail. Open from 7.30pm to Midnight. Ticket Prices S$39 for adults and S$25 for children. River Safari is the latest addition to the zoo (opened in 2013) and is a river-themed wildlife park showcasing critters from various river zones around the world including the Mekong, Nile, Amazon and Mississippi which can be viewed while travelling on a boat or on foot. Opening Hours: 9am to 6pm. Admission Charges: S$25 for adults and S$16 for kids. 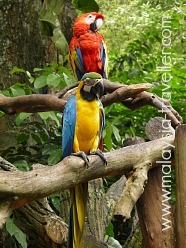 Run by the same management as the Zoo but in a different location, Jurong Bird Park is another first class nature destination with 4 large walk-in aviaries containing hundreds of colourful and exotic birds from Asia, Africa, Australia and South America. Open from 8.30am to 6pm. Ticket Prices: S$25 adult and S$16 child. Multi Park tickets (called Park Hopper Specials) are available covering all 4 of these parks (the 3 zoo parks and the bird park) and enable visitors to visit 2, 3 or 4 parks at discounted rates and they can be visited on different days within a 30 day period. See Wildlife Reserves Singapore's informative website for details on location, how to get there, show timings and everything else you need to know. The Singapore Botanic Gardens is one the finest botanical gardens in the world. It was established in its current location in 1859 and has been maturing and improving ever since. Not only does the garden look beautiful but it also performs a valuable role in botanical research into areas such as the propagation, hybridisation, conservation and uses of plants and is equipped with laboratories, libraries and other facilities. For the tourist, the main highlights include the National Orchid Garden, Heritage Trees, Saraca Stream Walk, Herbarium, Ginger Garden, Swan Lake, Children's Garden, Bonsai Garden, Fragrant Garden, Healing Garden and Foliage Garden. Delightful sculptures, fountains, sundials and bandstands add to the soothing atmosphere of the gardens. The Botanic Gardens are open from 5am to Midnight and admission is free. The National Orchid Garden is open from 8.30am to 7pm and entrance costs S$5 for adults. Kids below 12 are free. Details on location and how to get there can be found on the official Singapore Botanic Garden website. For a relatively small and crowded island, Singapore has set aside a surprisingly large area as recreational green spaces, parks and nature reserves. One such park which I can recommend is known as the Southern Ridges and comprises 4 contiguous parks, Mount Faber Park, Telok Blangah Hill Park, Hort Park and Kent Ridge Park. As the name suggests, the park occupies the ridge of high ground overlooking Sentosa Island and the southern approaches to Singapore. Easily accessible from the city centre, Southern Ridges allows exercise and fresh air lovers to enjoy a hike amid lush forest with far reaching views. 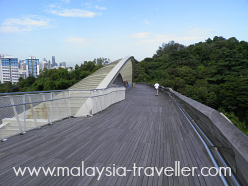 The trails include a stunningly designed wood and steel bridge known as Henderson Waves as well as an elevated steel walkway longer than any I've seen elsewhere. You could easily spend 3 hours or more covering the full length of the Southern Ridges trails. You can find out more on National Parks' official website. 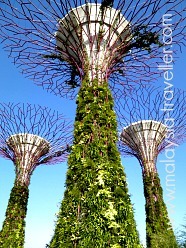 - the man-made grove of Supertrees which are spectacular vertical plant displays with an elevated skyway and a nightly light and sound show. - Cloud Forest is a massive glass conservatory containing a 35 metre artificial mountain and waterfall planted with high altitude vegetation amid cool moist air. - Flower Dome is another giant glass-house conservatory featuring plants and trees from different regions of the world. - Other Outdoor Garden displays. The Outdoor Gardens are open from 5am - 2am daily while Cloud Forest, Flower Dome and the Skyway are open from 9am to 9pm. For overseas visitors, admission to the two conservatories costs S$28 for adults and S$15 for children aged 3-12. The Skyway costs S$5 and S$3 respectively. You can find more details of what to see on the official website. 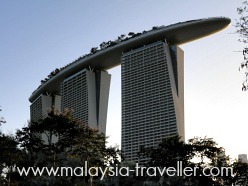 Wherever you go in downtown Singapore you can hardly fail to notice the spectacular Marina Bay Sands with its three 200 metre towers, occupied by hotel rooms, topped and linked by Sands SkyPark which comprises an observation deck, a stunning roof top infinity pool, gardens and restaurants. Use of the swimming pool is exclusive to hotel guests but if you cannot afford to stay in this luxury hotel you can still access the observation deck for a fee (details here). Marina Bay Sands calls itself an integrated resort and, in addition to the hotel, the complex includes a casino, an Expo & Convention Centre, an Art Museum and a high-end shopping mall with a Venetian style canal running through it. Another integrated resort is Resorts World Sentosa located on Sentosa Island. 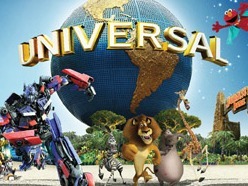 Attractions here include Universal Studios Singapore, (a cutting edge theme park divided into seven zones with rides and shows based on different Universal Studios movies), and Marine Life Park which comprises three aquatic attractions: S.E.A. Aquarium, Adventure Cove and Dolphin Island. In addition, Resorts World provides a range of hotel accommodation including Hard Rock Hotel, Beach Villas and TreeTop Lofts. There is also a casino, conference and wedding facilities and plenty of restaurants. For more details about Resorts World's hotels and to obtain discounted room rates, take a look at Agoda's website. 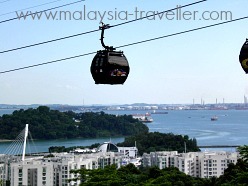 The most spectacular way to get to Resorts World is via the Singapore Cable Car which runs from the top of Mount Faber to Sentosa Island and provides a bird's eye view of the harbour front and Singapore port along the way. Ticket prices are S$29 for adults and S$18 per child. Various promotions and packages are available. See their official website for details. 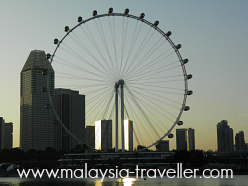 Singapore Flyer claims to be the world’s largest observation wheel, standing 165m above the ground. This makes it 30m higher than Europe's tallest Ferris wheel, the London Eye. However Singapore may have been overtaken (just) by the High Roller in Las Vegas which is 2.7m taller. No matter, the Singapore Flyer offers panoramic views of Marina Bay and the city and is certainly worth a visit. You can find more details, including ticket prices and opening hours on the official website here. A great way to see some of Singapore's top sights in comfort is by taking a 40 minute river cruise on an electric and environmentally friendly bumboat. Indoor and outdoor seating is available. The route covers famous landmarks such as Clarke Quay and Boat Quay, Merlion Park, Marina Bay, the Promenade, the Esplanade and the Fullerton Hotel. Tickets cost S$22 for adults and S$12 for children. You can find the jetty locations here. The best way to soak up the atmosphere of Singapore is on foot. It's not a small city but many of its best known heritage sights can be found in a relatively compact area which can be covered by foot. Various operators provide guided walks or it is possible to find self-guided itineraries on Google. 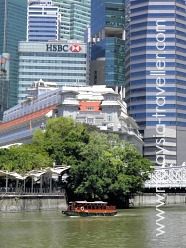 Here you can find details of a walk which I took recently in Singapore. 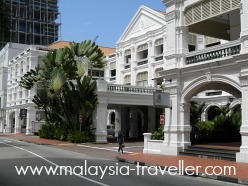 No trip to Singapore is complete without popping into Raffles Hotel. Of course it is the ultimate in colonial-era luxury and not a cheap place to stay but thanks to its open courtyard design it is possible for non-residents to have a peek at the public areas without risking confrontation with security guards. The Long Bar (home of the Singapore Sling) and the Bar & Billiard Room are recommended for smartly attired tourists with some cash to burn. While in the vicinity, Chijmes across the street is another complex of historic buildings which has been tastefully converted into cafes, bars and restaurants. I would also include the Tiger Beer Brewery Tour under this heading. I've not been yet but it is on my list for next time. 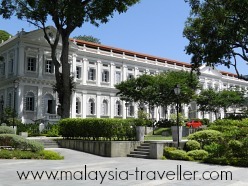 Hope you enjoy discovering these Top Singapore Attractions as much as I have. If you would like more information on hotels in Singapore, including availability, discounted room rates or to make a booking, you can take a look at Agoda's website here.